My son has long wished that he could visit bike skills parks or skate parks year round. 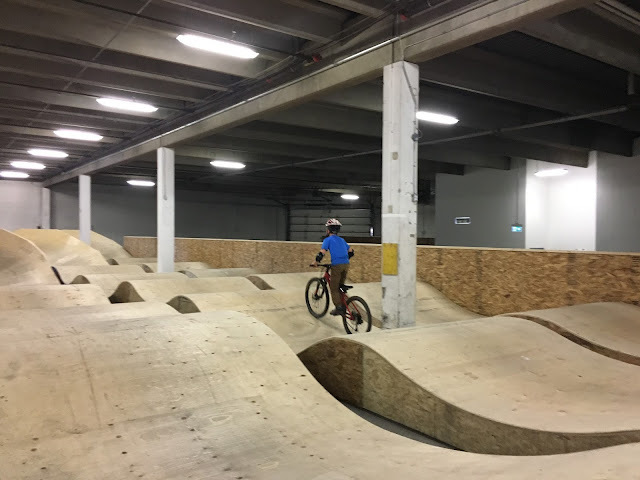 His dream has now come true with Calgary's first indoor bike park opening its doors at the end of October. 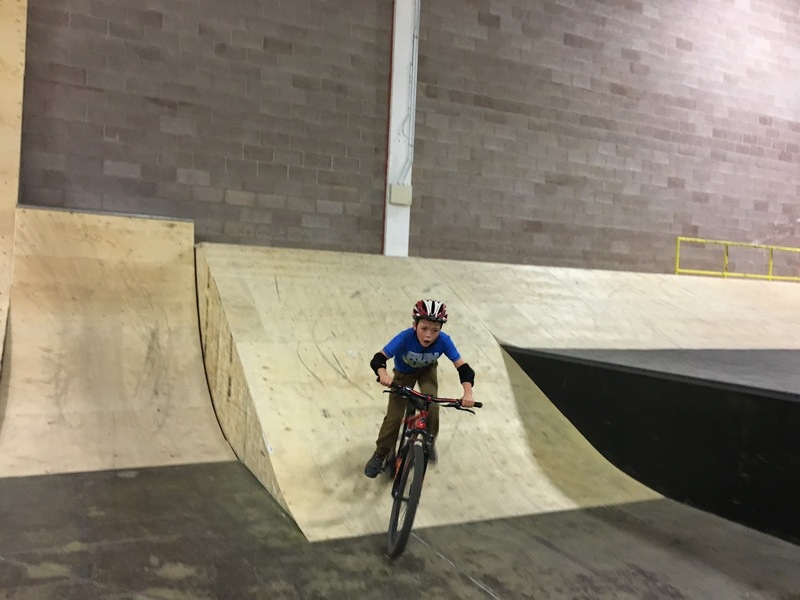 B-Line Indoor Bike Park is located in NE Calgary off of Memorial Drive, and it will be "the place to be" this winter for families who don't want to put their bikes away for the season. Picnic tables and areas to eat snacks or lunch (bring your own food,) and for parents to hang out when not supervising or riding. My son didn't spend a lot of time in the "true beginner area" but I can see this being a great place for young children on balance bikes or for kids not used to riding on a pump track. There is a very small pump track in this area that works as a wonderful introduction to test whether your child is ready to move up to the larger more "intermediate" pump track. Parents with novice riders will feel comfortable having their children riding in this area because it's safe to assume there will be no big riders in this area or teenagers ripping around at high speeds. This is a safe zone to work on basic skills needed to move on to the other areas of the park. While the main pump track would be considered part of the "beginner area," you will see riders of all abilities in this part of the park because everybody loves a pump track! And the one at B-Line promises hours of fun. My son spent a LOT of time here trying to ride over as many bumps in a row as he could without pedaling (a goal when riding on a pump track) and working on the posture of standing with flat pedals. For a good idea of what the pump track is like, scroll back up to the first video I posted. And safety tip for this room: both pump track loops are multi-directional. There are no arrows telling kids which direction they should ride. And most of the time, this is not a problem because you should be able to look at the track, and see which direction other kids are riding. However, there are a few blind spots at the back where you can't really see other riders. My suggestion if visiting the park with young riders: Use the pump track when it's quiet without a lot of traffic on it, stand and watch before riding in, and look carefully to make sure nobody is riding towards you on the loop that you want to ride. Ideally, in my personal opinion, one loop would be marked for clockwise riding, and one would be marked for counter clockwise riding. This way, nobody would be at risk of getting hit by another rider, but everybody would still have freedom to do a loop in the direction that is most comfortable for their style. There are 4 progressive jumplines, marked green for beginner and intermediate, blue for advanced, and black for expert. Each line is also clearly marked with arrows for where to start/finish. This gave me peace of mind that my son wouldn't collide with another rider here, or even worse, take out a preschooler! My son spent close to an hour on the two easier jumplines, with breaks to go play in the other parts of the park. He loved the table top style jumps that he could practice jumping. And while he wasn't quite able to jump them yet, I can see that he would progress quickly if we spent a few more afternoons at the park. Kids learn by doing, and the jump section of this park is designed to be progressive for all ages and abilities. The big air room called "The Bar" reminded my son of a giant skate park. He was riding up the walls, playing on ramps and mini half pipes, and trying to do jumps. The best part though (for us biking families) is that there are no skateboards or scooters allowed at B-Line. This is purely an indoor BIKE park. Realistically speaking though, there are no arrows on the street or in a skate park, nobody is standing around directing traffic at a skate park or at a bike skills park, and you have to learn to communicate with other riders. There will always be risk when practicing "street style biking." While B-Line probably could take steps to make this room "safer," I don't believe that would ever be their intention, and I'm sure they didn't really design this room to be "toddler friendly." It is the "Big Air" room after all. If the park was exceptionally busy, or if this room was full of older teens doing big jumps, I would encourage my son to just play in a different room. Or we'd do what we did on our recent visit - and arrive early as soon as the park opened for the afternoon. In theory, my 8-year old could have done the foam pit jump, and plenty of younger kids were doing it, but my son wasn't sure if he could commit to the "not braking" the entire time, and wasn't sure what the landing would feel like. Again, as with everything at B-Line though, it's all progressive and he'll work his way up to it on a future visit. The park is suitable for all abilities and ages with progressive features for kids as young as 2 or 3 years of age on balance bikes, all the way up to expert BMX riders. Children 7 and under must be supervised at all times but parents don't have to pay if they aren't riding. It is recommended that you either rent a BMX bike or a dirt jumper on site, or that you bring your own bike with you. If bringing your own bike, please make sure it's been cleaned since your last mountain biking trip. Adults can also use their own full-sized mountain bikes, but again, would do best on a smaller BMX style rental bike from the park. Helmets are required at all times inside the park and padding is highly recommended. Helmets and bike padding come with all rentals from the park. The only thing that would prevent my family from visiting weekly (other than the drive across the city since we live in the NW) is the rather "high" cost of visiting the park. Admission is comparable and actually more affordable than many other family attractions in the city, but it doesn't mean that it's "cheap" family entertainment. We'll be visiting a lot this winter so that my son can ride around the "bar" as you can watch in the video below. The $30 day pass is comparable to Winsport's Canada Olympic Park where youth pay roughly the same price for a full day of skiing. Adults however pay $46, making B-Line the more affordable option here. So overall, admission prices to B-Line are not completely out to lunch with what other facilities in Calgary are charging. But, it still doesn't mean you're in for a cheap day and kids may need to start saving their allowance money if they want to visit often. For other admission options (including annual passes) visit the B-Line Indoor Bike Park website. I'd love to see a discounted "early bird" admission option for riders who want to visit the park between 3-5pm before the evening rush. I'm hoping that there will be lessons offered in the future for school-aged kids and teens who would like to learn progressive skills including jumping and trick riding. Finally, I've had questions about whether the park would be able to provide gift cards or ride vouchers for Christmas presents. I think this is a great idea and I'd love to put some in my own child's stocking. Please visit the B-Line Indoor Bike Park website for full information on hours, pricing, the facility, and bike rentals. Disclaimer: We were given complimentary admission to the park for this review. As always, all opinions are my own.